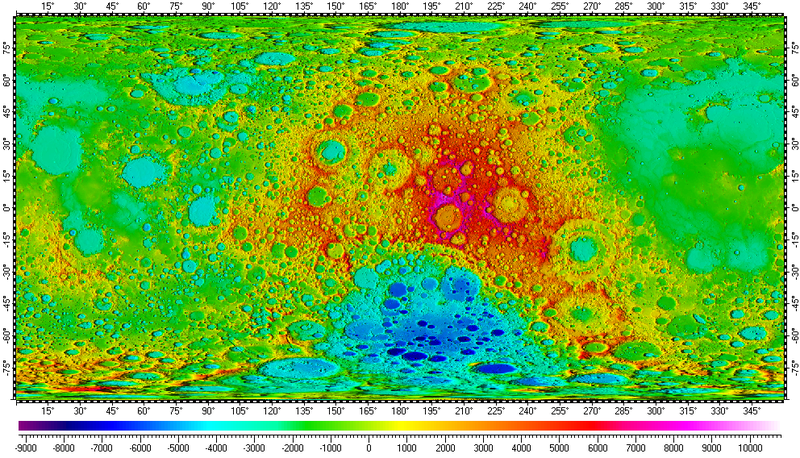 The datum of Digital Elevation Model of Moon, included in the archive, derived from raster data of Lunar Orbiter Laser Altimeter (LOLA) experiment, version 2.0, which was part of Lunar Reconnaissance Orbiter (LRO) mission, and distributed by Planetary Data System (PDS) of NASA. Base resolution of the datum is 1/256°. MoonLongLat_.zip - Size: 8,014,331 bytes (7.64 MB); MD5: 58EC7BF39AC03EB5A6149B1B0A3AE1A5. _LDEM_0N_90N_0_180.zip - Size: 1,267,822,829 bytes (1.18 GB); MD5: 5F61BFE405724CF00DBFC538EFDF61C1. _LDEM_0N_90N_180_360.zip - Size: 1,186,649,875 bytes (1.10 GB); MD5: A3FFAADB1E8B4909B2F47E9B1045E6F8. _LDEM_90S_0S_0_180.zip - Size: 1,344,179,851 bytes (1.25 GB); MD5: 603209368E946517F54B2ECCAF0216E9. _LDEM_90S_0S_180_360.zip - Size: 1,320,367,489 bytes (1.22 GB); MD5: F1D18B6FA36A0BF24E502397FF9D5BB2. Files from this set should be kept in a common folder \LongLat, for example. Only the first file "MoonLongLat_.zip" will be selected by user upon installation entire datum from this archive by using Spatial Aspect Map Locator. See user manual of the program for more details.